Sweet Vidalia onions and meaty portobello mushrooms get sauteed until perfectly caramelized and rich in bold flavor. A hint of balsamic adds a sweet, acidic touch to the mixture and then piled high on grilled French baguette and topped with tangy blue cheese crumbles. Onions are in high demand in my house. I use them in every savory recipe known to mankind, so I always make sure to replenish my onion stock with every trip to the grocery store. As soon as May hits, I trade in my yellow onions for sweet Vidalia onions. I have two old pottery bowls that my grandmother gave me a few years ago that I designate to housing onions and potatoes. I keep one bowl upstairs in the cabinet underneath my sink and the overflow bowl downstairs in the basement pantry where it’s dark and cool. I’m constantly moving onions from downstairs bowl to the upstairs bowl and replenishing the stock whenever the bowls get low. Vidalia Onions are known as the sweetest onions on the face of the Earth and also considered the most famous of all the onion varieties. In my humble opinion, I have to agree. I always gravitate towards the Vidalia bin at my local grocery store. I wanted to highlight the sweet onion, so I decided to make it the star of the show in this Caramelized Onion & Mushroom Crostini. The sweet Vidalia onions get even sweeter as they simmer in butter and begin to caramelize and soften. 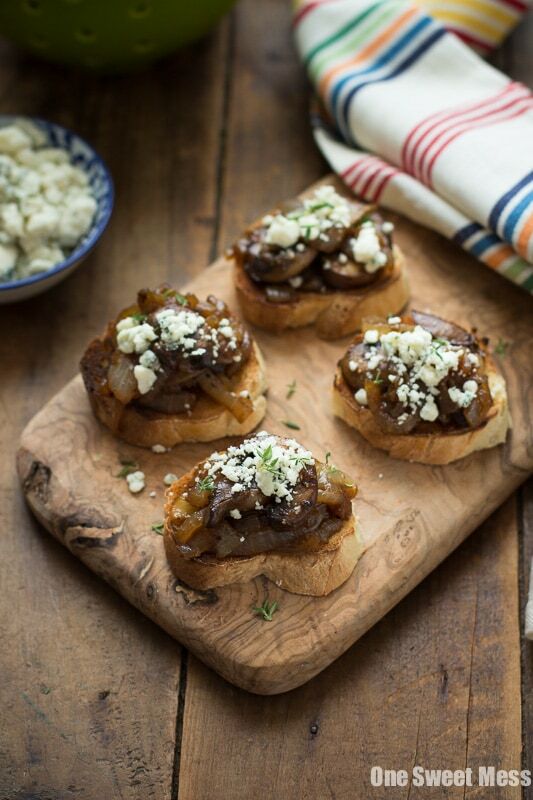 I paired the onions with meaty portobello mushrooms and tangy blue cheese crumbles to help balance the sweetness. Once all is said and done, the onion and mushroom mixture gets piled high on grilled crusty bread (if you’re brave, you can turn your oven on to toast the baguette slices) and topped with blue cheese crumbles and a sprinkle of fresh thyme. These little bites are perfect for your next summer bbq party or gathering. Heat olive oil in a large sauté pan over medium-high heat. Add the mushrooms and give them a toss in the olive oil. Cook the mushrooms until they become brown on the outside and tender, stirring occasionally, about 5 minutes. Sprinkle with salt and pepper at the end. Transfer to a bowl and set aside. Turn the heat down to low and butter to the same sauté pan you cooked the mushrooms in. Add the sliced onions and toss to coat in the butter. Continue to cook, stirring often, until the mushrooms turn an amber brown, about 30 minutes. Season with salt and pepper to taste. While the onions caramelize, slice the baguette into 1/2-inch thick rounds. Preheat an outdoor grill or indoor grill pan. Grill the bread on each side for 30 seconds to 1 minute, or until golden brown on each side. Add the mushrooms to the pan with the caramelized onions; toss to combine. Stir in the balsamic vinegar and honey. Continue to cook for 3 minutes. Season the mixture with salt and pepper to taste. Top each piece of toasted bread with a small mound of the onion mixture. Top with a sprinkle of blue cheese crumbles and pinch of fresh thyme. Serve immediately. Disclosure: This post is sponsored by The Vidalia Onion Committee. As always, all opinions are 100% my own. Thank you for supporting my site as I work with brands I adore. Can you believe I’ve never caramelized a vidalia onion?? It sounds sooo tasty in its natural caramel-y sweetness. These crostinis are pure perfection. Gimme dat blue cheeese! This looks amazing! So much rich umami flavor :) Pinning! We have been buying so many vidalia onions lately – they are so sweet and good!! These look awesome! haha oh gosh I definitely put onions in every savory dish too! These crostini sound fantastic – love the blue cheese! Caramelized onions are just out of this world. What a great appetizer! Onions and mushrooms are one of my favorite combinations. So satisfying, all on their own, but topped with blue cheese and piled on crusty bread?? That’s a meal! Vidalia Onions are my absolute favourite. I eat them constantly. My family knows to always pick them up on any grocery run. They have the bet flavour in the world. I love these crostini, I can’t wait to try them. Pretty and yummy, it’s the perfect combination. Completely agree, vidalia are hands down the best onions out there. Carmelizing them like this with portobellos is such a delicious combination! I am a total onion freak and use onions in almost everything I cooked. Love these crostini – I could eat a plateful of crostini for my dinner! I love this so much. My mother used to caramelize onions and serve them on buttered bread to me as a snack. Sigh… Pinned! This is gorgeous and perfect and I could totally make a meal out of it. I will take any excuse to caramelize a bunch of onions, especially vidalias! I’m with you – I use onions in just about every single savory recipe I ever make, and Vidalia season makes me happy. These crostini are the perfect combo of sweet and savory! I could also see making a giant flatbread version of them and then cutting it into pieces. These look like the perfect savory bites! I love that crumble of blue cheese on the top. I bet these have a ridiculous amount of flavor! These crostini look amazing. And so incredibly addictive too. Love anything with blue cheese and onions!